Welcome to all Germans and to all who love German 'Gemütlichkeit! - Willkommen in Kapstadt! In our ExpatCapeTown guide you will find all the relevant information and resources for all those things German for all visiting or living in Cape Town and all who enjoy German goodies. What's in it for Germans in Cape Town? There are not only German playgroups, kindergartens and a German school in Cape Town, but also German groceries are available at several specialist stores, although some of the bigger supermarkets stock an ever growing range of German favourite staples and snacks as well. A German bookstore caters for all book lovers and holds regular events where German expats meet - as well as the German club and the German Language Insitute (Goethe Zentrum) in Gardens of course. Read on to get the details below. There is a big German community living in Cape Town and therefore it is easy to feel at home in the city. The areas where many of them live are the suburbs Tamboerskloof, Gardens, Oranjezicht and Higgovale as these suburbs are close to the German School. Many Germans also live in the Blouberg area and many of them feel at home in Hout Bay where there is another International School (not a German school though) teaching the IB curriculum leading to the International Baccalaureate. Another huge community lives in the Helderberg area around Somerset West, where the big German supermarket is located too. Germany: The German general consulate is located in the city centre. Consult their Website for more information on opening hours and contact numbers. Austria: There is an honorary consul in Cape Town. Contact the Austrian embassy in Pretoria with any queries. 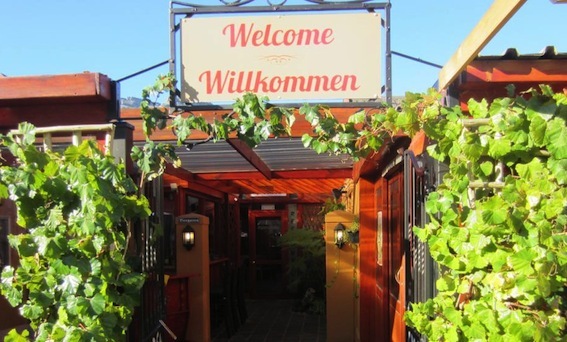 The German Club meets at the 6 Roodehek Terrace, a restaurant in Gardens. The Swiss Club meets in Greenpoint and has got several groups you can join. And this is a great annual meet-up for German expats in Cape Town - even for those without kids: On the first Saturday of November, the German School Cape Town holds their popular annual German Bazar at the school's premises from 10h - 22h. Tickets can be bought at the door. This is one of the events in Cape Town which is not only an event for the Germans, but for all enjoying German hospitality. With great kids entertainment while the parents will enjoy German specialties and German beer, wonderful wine or Swiss raclette. Large beer tent, talent show, skate park, fuffie-slide, Christmas Market, Ice-cream stand and the ever popular Mozart Cafe. Join the community at the school in Tamboerskloof, parking and shuttle service are signposted from Kloof Street. Find other expat communities in Cape Town here. German School: The German International School (DSK or Deutsche Schule Kapstadt) is located in Tamboerskloof and a satellite school of the DSK in Parow. The German school offers instruction with German as mother tongue and from Grade 5 onwards also classes for non-german speaking children which are taught in English. There are also evening classes offered for parents and the general public at the school. Entrance exams for current Grade 4 learners are held regularly and applications are open also for non-German speaking pupils as there are English-medium classes for senior primary and high school students too. German Kindergarten: There are several German kindergartens in the Cape Town area with German instruction and German kindergarten teachers. There are several German playgroups for smaller kids in some Cape Town suburbs, such as KunterbuntKidz in Tableview which was established by a former teacher of the German primary school. Please also contact the German school, should you want to get info on German playgroups in other suburbs and let us know about your experiences with other German playgroups in Cape Town. Goethe Zentrum: German Language Courses are offered by the Goethe Zentrum in Cape Town, which is affiliated to the Goethe-Institut in Germany. Deutsche Schule: German Language Evening Classes (German as foreign language/DaF). Classes 'German for Adults' are held also at the German School. Should you have any questions regarding learning German or maintaining your communication skills, please contact me. As a German language teacher by profession, I have loads of tips on effective learning and language skills development and will gladly pass these on. I taught many classes at Goethe-Institute, colleges and universities in several countries around the world and have a treasure of secrets to learning German fast and effectively. :-) Deutsch lernen macht Spass! Kapstadtmagazin is an online travel magazine in German providing a wide range of information: news, things to do, events and much more. There are also English and French versions available. Echo is a German magazine with articles written by Germans mainly servicing the market of the German "swallows" with articles on history, economy and politics. Kapstadt auf gut Deutsch is a bi-annual magazine with articles in German with many accommodation tips for tourists to South Africa. There are several churches offering German speaking mass and services for Germans living in or visiting Cape Town. These communities also hold regular German speaking mass services and are active with youth groups, social outreach activities and community support. If you want to get involved or join, best enquire for more info with the churches. You will find links to their websites below. This information about Germans in Cape Town shall help you to orientate yourself when arriving as a newcomer in the Mother City. If you miss some information in my list or like to share your secret about the Germans in Cape Town and German lifestyle, please contact us.